C-MRA is delivering the programme of follow-up training, support and extension work with the farmers in Asumbi who completed the first farmer training in the permEzone pilot program. They are a registered Community Based Organization based in Migori County, a district bordering Lake Victoria in South-Western Kenya. Paul Omolo is C-MRA’s representative for Phase 1 of the permEzone pilot program in Migori county, and will be a key member of the MEL team for research and data collection in the field. Paul has a BSc in Horticulture from Moi University, Eldoret and has successfully completed a Professional Certification Course in Program Monitoring and Evaluation with The Kenya Institute of Management. He took his Permaculture Design Certification (PDC) course in Laikipia Permaculture Centre. Previously, as a member of the Permaculture Research Institute, Kenya's projects team, he worked for the USAID Kenya Horticulture Competitiveness project, initially as a Field Agronomist and then as Project Coordinator in Migori County. He has also worked as a Field Assistant (Horticulture) at Sauri Millennium Village, and as a Sales Agronomist for East African Seed Company. Reagan Okoth is the Field Extension and Research officer for the permEzone Pilot Programme. He grew up in Asumbi, and his understanding of the people, language, and culture underpins his commitment to see communities bridging together to develop sustainable working models. Currently pursuing a Master of Science in Environmental Planning and Management at Kenyatta University, he holds a Bachelor of Science Degree in Coastal and Marine Resource Management, and took his Permaculture Design Certification course in Drylands Natural Resource Centre. 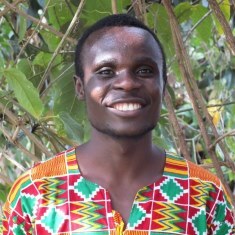 His prior experience includes working as a research assistant with Kenya Marine and Fisheries Research Institute on Mikoko Pamoja, a community carbon offset project in Kwale County, and as a project intern with University of Helsinki’s Taita research Station implementing the Adaptation for Ecosystem Resilience in Africa project.